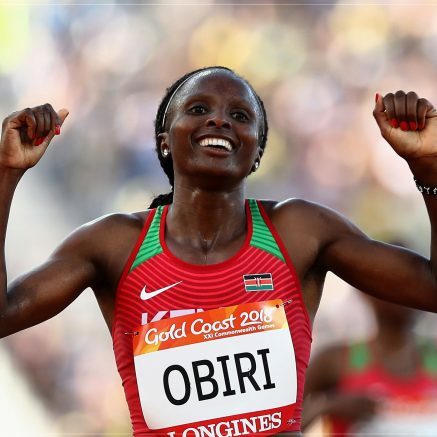 14th April 2018 – Hellen Obiri (KEN) added another title to her ever-growing resume with a dominant display in the 5000m final at the Commonwealth Games. The defending IAAF World Champion looked in complete control throughout the race, gradually increasing the pace over the final kilometre and cross the line in 15:13.11. This title adds to the aforementioned World gold, African gold and World Indoor gold, as well as an Olympic silver that Hellen has already collected. Shortly after there was another gold for PACE to celebrate as Dina Asher-Smith (GBR) combined with her English teammates to take victory in the women’s 4x100m. Their time of 42.46 was a new English record. Perri-Shakes Drayton (GBR) took the track for the third leg in the women’s 4x400m final as her English team narrowly missed a medal, taking fourth place in 3:27.21 on this occasion. The previous day Timothy Toroitich (UGA) placed seventh in the men’s 10,000m final, improving on the eighth place he took in Glasgow four years ago.